These two musicians are among the most accomplished artists in jazz. Both are respected elders, masters of their craft with no living peers. In the mini-biography of Gibbs that he wrote for allaboutmusic.com, writer Scot Yanow calls Gibbs “One of the most hyper of all jazzmen…” Of DeFranco, Yanow states he “is one of the greatest clarinetists of all time”. That is pretty heady stuff, coming from a writer of Yanow’s repute. The men have other things in common. Gibbs won an amateur contest playing the xylophone when he was 12; DeFranco won a contest sponsored by Tommy Dorsey when he was 14. Both men spent most of their careers playing instruments for which others were considered “the best”, i.e. Lionel Hampton and Benny Goodman, to mention only one example for each. Gibbs was born October 13, 1924. After finishing his military service in WWII, he joined the Tommy Dorsey band but quit after one night because he didn’t find the music challenging enough. He has played with many of the biggest names in jazz, including Benny Goodman, Buddy Rich, Max Roach, Woody Herman, Art Blakey, Conte Candoli, Pete Jolly, and others. For several years he was the musical director of “The Steve Allen Show” on television. DeFranco, born February 17, 1923, has also had quite a career. His big break came when he was chosen to join the same Tommy Dorsey band that Gibbs opted out of. Ultimately, DeFranco found swing music and Dorsey’s band leading style as limiting as Gibbs had. Unlike Gibbs, DeFranco tried to blend in with Dorsey’s swing band anyway. The effort failed, and after four years Dorsey fired DeFranco. After that, DeFranco played with the likes of Count Basie, Billie Holliday, Clark Terry, and Art Tatum. For a while, he had his own quartet, consisting of himself, drummer Art Blakey, pianist Kenny Drew, bassist Eugene Wright. After Gibbs and DeFranco met, they released a long string of albums which they co-lead. Just about any of those albums (that I’m aware of, anyway) would fit in as a “Jazz For A Saturday Night” nominee. Narrowing the choice to just one seemed a daunting task at first. Until I saw the title “Terry Gibbs & Buddy DeFranco Play Steve Allen”, that is. At that point, the choice was made for me. Explaining who Steve Allen was, in case you actually do not know, would take pages, and I’m already more than halfway through my self-imposed 1,000 word limit without having talked about the MUSIC yet. So instead of telling you about Steve Allen, I’ll refer you to his web site and an extensive biography of him on the Wikipedia web site and then there is also this page about him on the emmytvlegends.org site. Track one is “I Used To Think That I Was Crazy”. At only a little over three minutes running time, this song has no time to waste and so the entire ensemble jumps right in from the git-go. It’s as lively and as toe-tapping as they come. A false-ending leaves you expecting more when the true end arrives seconds later. Up next is “Sleepy Old Moon”. As the title implies, this one is a somewhat more mellow song. It has a happy feel to it that leaves you imagining Allen smiling as he picked out the notes with one hand and wrote them down with the other. “Until I Left Chicago (I Never Had The Blues) is up next. This is another piece of music that it is impossible to listen to and be sad at the same time. Come to think of it, I suppose that is the simple secret behind Allen’s musical genius. Whether fast or slow, his music made people feel good. “Mister Moon” is a fast-paced, interesting song whose head somewhat reminds me of (and might well have inspired) John Williams’ “Star Wars Cantina” from the original “Star Wars” movie. Williams has said he wrote the Cantina song to help impart a 1940’s jazz feel to that particular scene in the movie. Over the years, that Williams tune has been popular with the general public, so I’ll save you the trouble of looking for it: “Star Wars Cantina” on YouTube. You’ll note that the similarity ends fairly quickly. Track six is called “Playing The Field”. It’s another delightful song that will make it hard for you to sit still. If you gave in earlier and listened to “Always On A Mountain” online and it bummed you out despite your best intentions, then listen to “Playing The Field” and you’ll feel much better! Here are Terry Gibbs and Buddy DeFranco in Copenhagen, Denmark, in 1983 with a different rhythm section consisting of Kenny Drew, Ed Thigpen, and Mads Vinding. “Love For Sale”, parts 1 and 2. “Alabama Baby” is next, and it has a pleasant, infectious beat from the beginning. Pianist Ranier nails it perfectly, with an almost but not quite boogie woogie feel. The two principals are never better than on this unassuming number. Skipping ahead to the final track we have “In The Mornin’ When The Sun Comes Up.” In what appears to be typical Steve Allen fashion, the sun comes up on a delightfully happy day, and this song perfectly reflects that. It’s a grand way to end an all-too-short visit into the mind of one of the greatest musical geniuses of all time, Steve Allen. I wish I’d had time to write about all thirteen songs on this fantastic album. Until you can find your own copy, you’ll just have to take my word that there is not a clunker in the bunch. 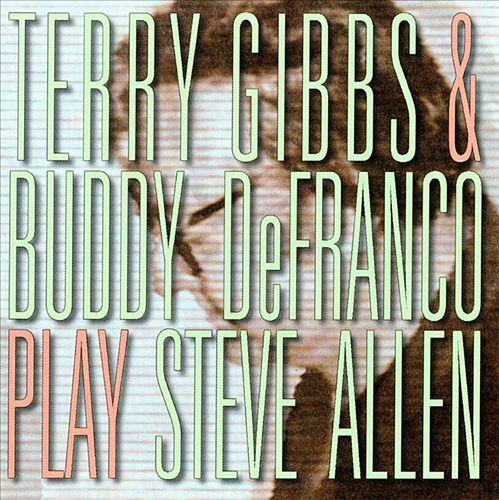 All-in-all, I’d have to say that I’m certain that you will find “Terry Gibbs & Buddy DeFranco Play Steve Allen” to be a fantastic addition to your personal playlist, for a Saturday (or any other) night! Steverino died on October 30, 2000, but Gibbs and DeFranco are still with us. You can learn more about Terry Gibbs and Buddy DeFranco on NPR’s web site. Al, another exhilirating review! I applaud you for giving these jazz masters the recognition they certainly deserve!